So far, 2019 had been positive for the Crypto market as the bears have taken a break, and since the beginning of the year, Bitcoin has tried to stabilize around the $4,000 level. Most of the Altcoins had a green week when Ethereum returned to its usual second place in the top market cap list. However, the competition with Ripple is still very tight. Tron had a great week, gaining around 40%. As long as Bitcoin remains stable, investors seem to feel comfortable investing in Altcoins, following the 80-95% drops in value seen in 2018. Interesting examples are Ripple, which has risen more than 100% from its floor of around 4,000 sushi, and Ethereum, which is currently trading around 0.037 BTC after reaching an annual low at around the 0.024 level. As mentioned previously, 2019 is smiling on crypto. However, the gains are not enough to attract new players and investors. The market is still under correction for the 2018 bear market, and it’s too early to declare a reversal. Total Market Cap $137 Billion | Dominance 51.5% in favor of Bitcoin. You Can Now Use Crypto to Purchase Nasdaq Tokenized Stocks. Good news for crypto investors as they can now buy tech-heavy Nasdaq digital stocks and other top US stocks, courtesy of DX.Exchange, a newly launched regulated crypto exchange. Binance Launchpad is Back: A New Era For ICOs? A new era is set to begin for blockchain projects after the world’s largest crypto exchange, Binance, reportedly announced that it is introducing a Binance Launchpad platform to help raise funds for new projects every month. Overstock to Become the First Major US Corporation to Pay Taxes with Bitcoin. Barely two months after US state Ohio enabled Bitcoin taxes, Overstock, a popular online retailer, says it will be the first major corporation in the state to pay part of its taxes with BTC next month. The USA is (Currently) Not The Perfect Location For Crypto Businesses: Kraken Sees 300% Increase in the Law Enforcement Requests Received in 2018. Cryptocurrency exchange Kraken has revealed that the United State is not favorable for crypto-related companies after receiving more than 470 requests from different US law enforcement agencies in 2018. The 51% Attack on Ethereum Classic (ETC): Coinbase States $450k in Double Spending while ETC Denies. US-based crypto exchange Coinbase has stated that it detected $450,000 of double spending after investigations into the 51% attack on the Ethereum Classic blockchain, which led to the hijacking of about $1.1 million worth of ETC. 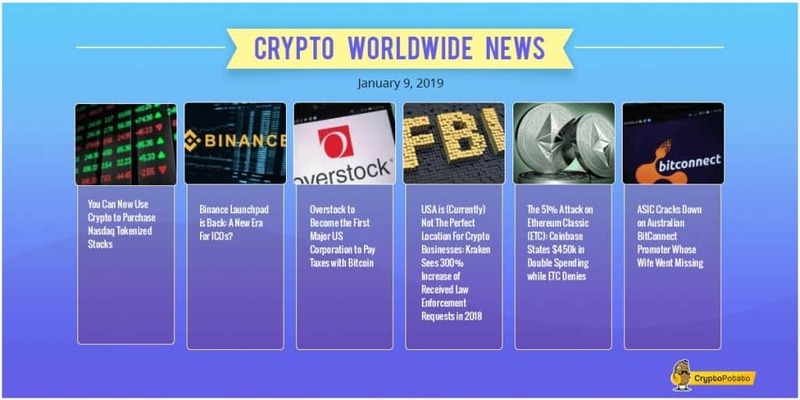 For more news, visit our Crypto News section. This week we have chart analysis of Bitcoin, Ethereum, Bitcoin Cash and Monero – Read more here. The post Crypto Market Update Jan.9: Bitcoin Consolidates Around $4000, Altcoins in Green appeared first on CryptoPotato.